As parents, we often learn very quickly that children tend to respond to things that are positive. It is difficult to be positive all the time, but we find that motivating them with something that makes them feel good about themselves will often work for them now and may build them up for the future as well. We do it because we love them and because we want the best for them in life. If there is one thing that we desire for our children, it’s that they grow up to be productive members of society. We also want them to be happy. This is going to benefit them but in many cases, it will also benefit the parents as well. The last thing that we want is to crush their self-esteem and we realize that words are a very important part of moving things in the right direction. Stacey Truman does her best to be a good mother at home but when she is at work, she tries to be a good mother to children as well. She works in the Kingston elementary school cafeteria in Virginia. Over the nine years that she has spent at the school, she has watched young children grow up to be teenagers and eventually, move out to face the world. It would be difficult to resist any motherly instincts that you may have when you are feeding children in the cafeteria. From time to time, she had those origins and she channeled that energy into something very popular, ‘Talking bananas’. 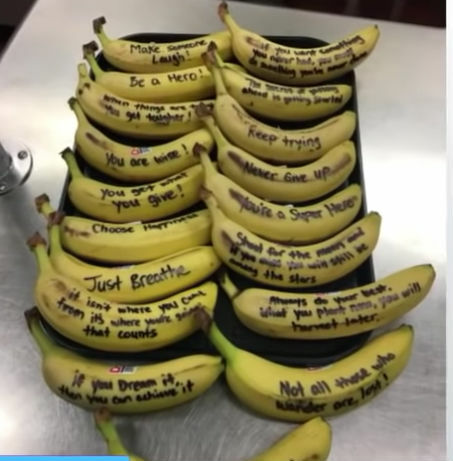 A long time ago, this lunch lady picked up the habit of putting positive notes in an easy to locate area for her children and she decided to take it to work as well. When her children’s lunches were packed at home, she would try to motivate them to do great things. She knew that doing so could change the way that her children think. 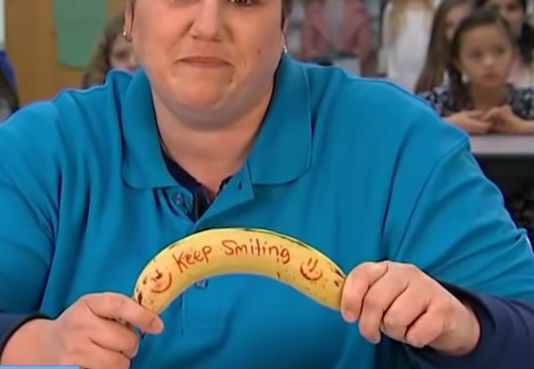 That is why she started writing inspirational messages on bananas at school. It would provide a little bit of motivation with those student lunches. And she took her permanent marker to school one day and did it as an experiment. Before long, the parents were in love with what it was bringing to their children and the school administrator enjoyed the idea. 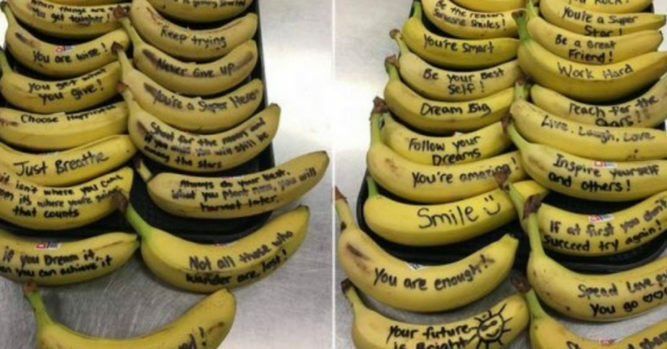 He even came to the cafeteria and surprised her one day by grabbing a banana that said: “be your best self”. A picture was taken and it was shared on Twitter, where it went viral. The children also loved what she did and they would run to lunch in order to get their special banana. Stacey continues to send these positive messages to children in hopes of inspiring them and doing her best to get rid of negativity. When children hear positive words, it helps them to grow in a healthy way. The world can be difficult sometimes but doing these little things can make a difference.